Ever heard of the term monoculture? If so, then you are likely wondering what does it have to do with hunting? 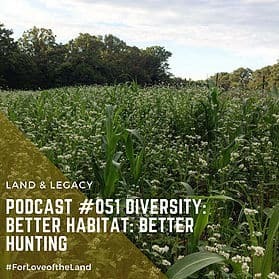 This week we devote our time to defining a monoculture, providing examples, and sharing how if present in the habitat, they can be managed to improve your hunting. It sounds like a big complicated word, but don't worry, this is a simple concept and one that if improved upon can be very beneficial. to your success as a hunter.